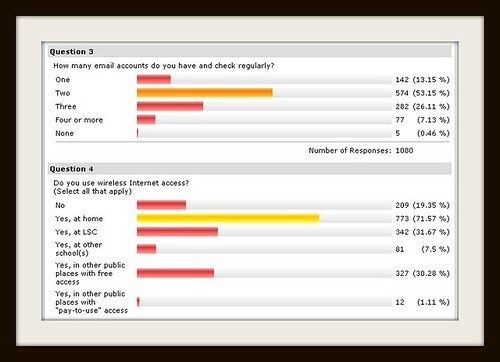 Question 3: How many email accounts do you have and check regularly? Question 4: Do you use wireless Internet access? Almost 72% say they have a wireless system in their home. I was rather surprised by this number. Sure, it’s relatively cheap and easy to setup a wireless router in your house, but I still would have predicted something more like 35-40% would have done so. Wrong. Paying for wireless in public places is something that 99% of the wired students are not generally doing. you can put me in that crowd as well. Free is good. Since about 81% use wireless somewhere and 71% use wireless at home, that leaves about 10% of the students who use wireless access points in other places but don’t have a router at home.